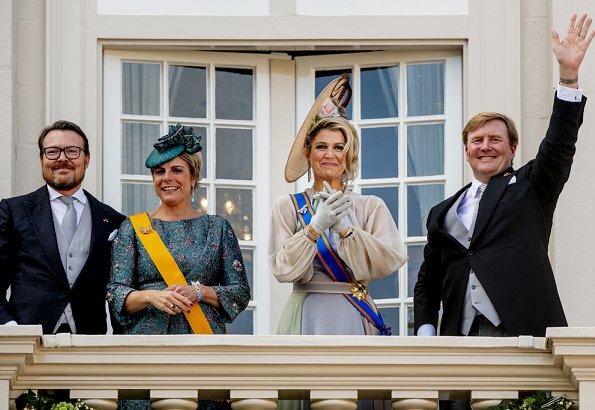 On September 18, 2018, King Willem-Alexander, Queen Maxima, Prince Constantijn and Princess Laurentien attended the annual Prince's Day held in the Hague. Prinsjesdag ('Prince's Day') represents the start of the new parliamentary year and on Prince's Day, Dutch Royal Family addresses a joint session of the Dutch Senate and House of Representatives in the Ridderzaal or Hall of Knights in the Hague. 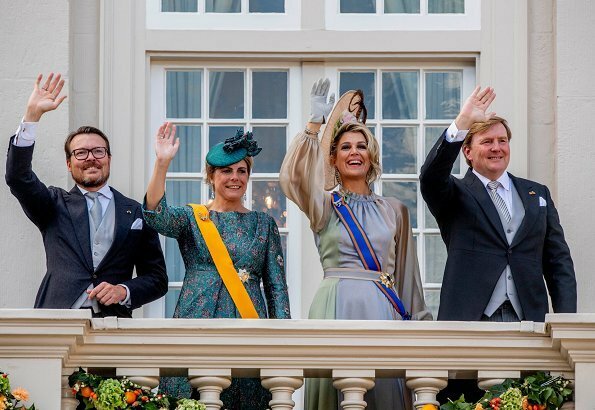 why is Queen Maxima wearing those ugly white gloves ? I do love her outfit. Maxima is beaming and glowing like always, but dress and hat are not that fantastic this year imho..
Laurentiens dress is a bit oldfashioned but ok.
Agree Helen. The whole outfit is completely over the top, but it doesn’t matter because Maxima has a warmth about her. warmth, that's the right word. 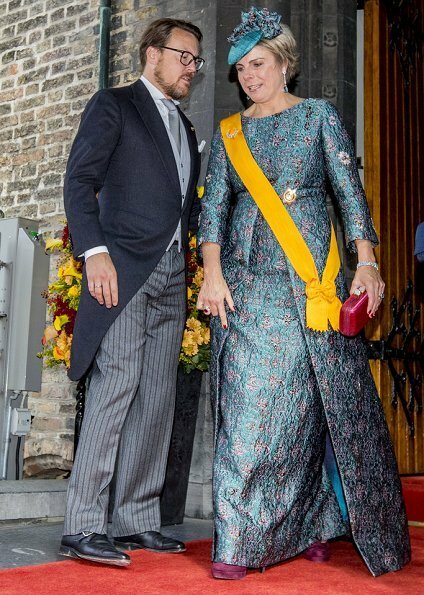 For me it is "a little bit too much" with the details of the hat, the many kind of stuff and the gloves - but I like Prince Constantijn`s beard. Wow, Maxima looks very pretty and regal. Dit lijkt verdacht veel op huisvlijt. De stof van de jurk ken ik; koningin Juliana of koningin Beatrix. En die veer op die halve hoed stond rechtop in Luxemburg een aantal jaren geleden. Kan niet missen! Haar oudste dochter en haar moeder dragen haar kleding. Het wordt er niet beter op. Wat een rare reacties altijd! Ben je zo'n ik weet het beter menneke? Deze zichzelf heer noemende figuur doet er alles aan om het Nederlandse koningshuis belachelijk te maken. Hij is een eerste klas betweterige zuurpruim. Kunt u geen Engels lezen? Maxima's dress is dreamy -- love its soft pastel hues, gracefully gathered sleeves, floaty lightness -- ravishing. The crazy angle of the hat is a somewhat jarring note, but at least the hat and dress don't clash, color-wise. Yea Maxima styled her hair. It looks very good!! The body of the dress is beautiful, but not a fan of the balloon type sleeves. I agree in regard to her hair. Some may call this a messy bun, but the "messy" part hanging down is curled nicely and is very pretty. I do not think the dress is as bad as others think, but wish the sleeves and neckline were different. It looks like the dress is wearing her, so many yards of fabric! ugly gloves, one of those ugly hats, and yes she's smiling prettily because, she's a fairy tale queen. Princess Laurentien doesn't look much better, stiff material, looks too big for her and the color is not good on her, and also a silly hat. The men look much better. I am just looking at these photos, and Hubby walks by. He says: "Why is this woman having a pancake on her head? Did it fall out of some window?" Hhm. Maxima´s dress is not quite right for the occasion. The occasion calls for a formal long day dress, but Maxima´s dress is more evening material, looks more like a gown with the shiny material, delicate sleeves and voluminous skirt with a train. Her shoes (which are horrid) are wrong for the occasion, too. 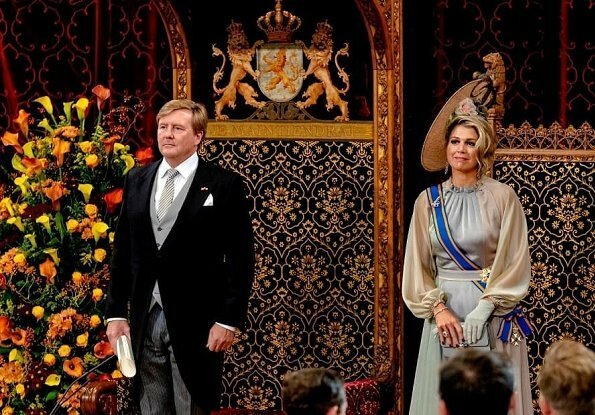 The hat alone won´t bring it back to day territory, and it´s a fairly loud and quirky hat at that, not what I would choose for one of the most formal occasions of the year in the dutch royal calender. Laurentien is doing better here, it think. Her outfit is more suited for the occasion. Beautiful brocade fabric, very stately. The lining of her cape thing is wonderful, and the hat ties it all together nicely. But: her shoes are a bit iffy too and they don´t match the colour of her purse; also, her cape dress has slight maternity vibes the way it´s cut, babydoll waist and all. Each item on it's own a longshot maybe except the gloves they are a no as they look faded in these pics. All together I just can't really describe what this is except to say this is not good and hopefully will never see the light of day again. I love her personality and she can do things the other royals cannot but this is just not good. agree with you, this is a mess again. Linda, perhaps they mean the fairy tale "Alice in Wonderland"? There is a queen of hearts in that story, isn't there? Maxima can be the queen of hats then! You mean ET mistook the hat for a satellite dish? 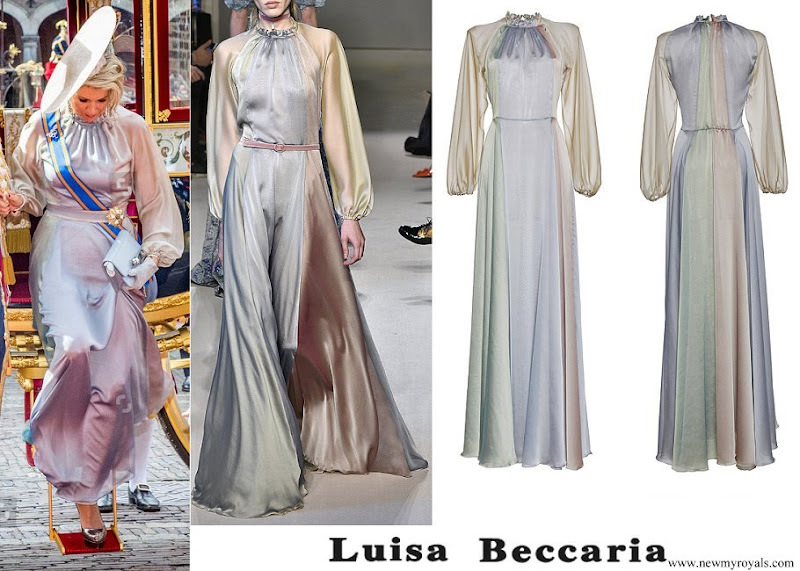 Maxima's dress looks like she grabbed some sheets or curtains and tied them around her waist. There is just too much volume. Her hair looks good though so there's that. Maxima can carry off this gown flowing every which way in the wind because she is a force of nature herself! Perhaps she can, but she shouldn't. I don't like this hat with the dress. Maybe it's the extreme tilt of it. She should have left the gloves at home. The seam on on left side of the front of Maxima's dress looks like it is pulling apart and it's bothering me. Laurentien looks like she is wearing upholstery fabric, and it looks very heavy. 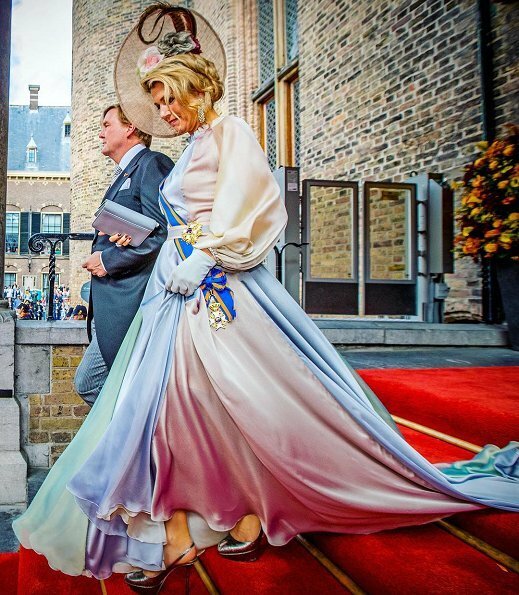 Maxima's dress looks like a voluminous nightgown with balloon sleeves, ridiculous hat and ugly gloves and shoes. 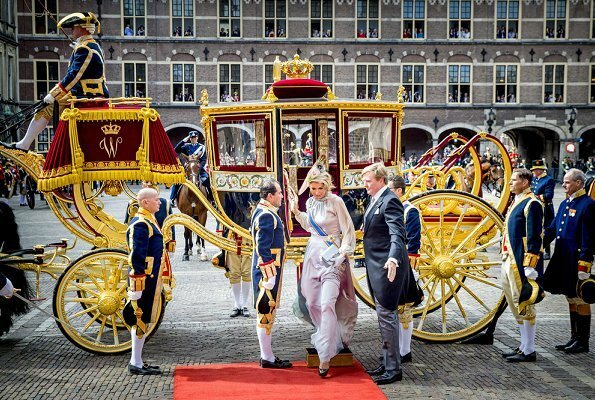 Riding in a carriage doesn't make her a fairy tale queen at all. She lacks elegance. Princess Laurentien do not look better, the dress is Granny-Look for me. Unbelievable how "our" queen can look so horrible one time and the next everything is just perfect. This was a total disaster, the whole look and specially her shoes (throw them away Max, they are out of fashion anyway, no need to pass them on to your mother) But good or bad look, no one can carry of jewelery like she does. There is so much happening with this ensemble, I do not know where to focus. This is too much, even for Maxima, too much volume in the dress and the accesories don't add anything special to the outfit. However, i like the soft colour. Does the messy hairstyle of Meghan spreads to the other royals? No, they can come up with messy hair all by themselves. I would have loved to see what Princess Beatrix would have worn. She always looks elegant and appropriate. Maybe she could give some pointers to her daughters-in-law? Maxima is smiling through a total mess and Laurentien matches the furniture. On the model is this dress acceptable, but on Maxima it loses it's character. Paired with gloves, shoes and weird hat is all a big mess. Not the best look for Q Maxima or Pss Laurentien. Really nothing special. The jewelry is very nice,that is all. This dress is more an evening gown and the hat doesn't fit here at all. A bit strange combo imo. The only complimentary thing I can say is that I like her hair this time. Her dress and accessories are like always-- over the top. As a girl, I actually used to have a night gown that looked very similar to her gown. Her gloves and hat were too much. I much prefer Maxima in simple lines, with minimal jewelry and accessories. She would look more elegant and regal. to dress Prince's Day is so weird really, long dresses with hats and cloves. Not the winner outfit from either of them. Many people here write how they hate Maxima´s hat, I like it but it is somehow wrong, wrong angle or something. Or it just did not fit to Maxima. Also I do not understand why very tall Maxima needs to wear such a shoes what make her 15 cm taller. The gown is too evening thing with nightie dressing gown feeling. Laurentin has very nice gown what suits her and the situation, but the hat spoils the impression. Hat should have been bigger to suit the dress. Over the top with everything! And being this far over the top is not far away from looking ridiculous. Lo siento no me gusta , es muy raro, o es que no la va.La sencillez es virtud y Máxima en esta ocasión lleva un estilismo muy confuso y recargado. And basically, the color of the dress did not suit or complement her complexion at all. So it will look blergh to every extent.